Word has itEl Niño is going to be whipping up some storms and cold weather across the U.S. this winter, which means we need to be drinking lots of hot cocoa and snuggling up with our loved ones! But if you’re like me, you don’t need cold weather as an excuse to indulge in some delicious hot cocoa, especially if there’s some yummy white chocolate melted in there! 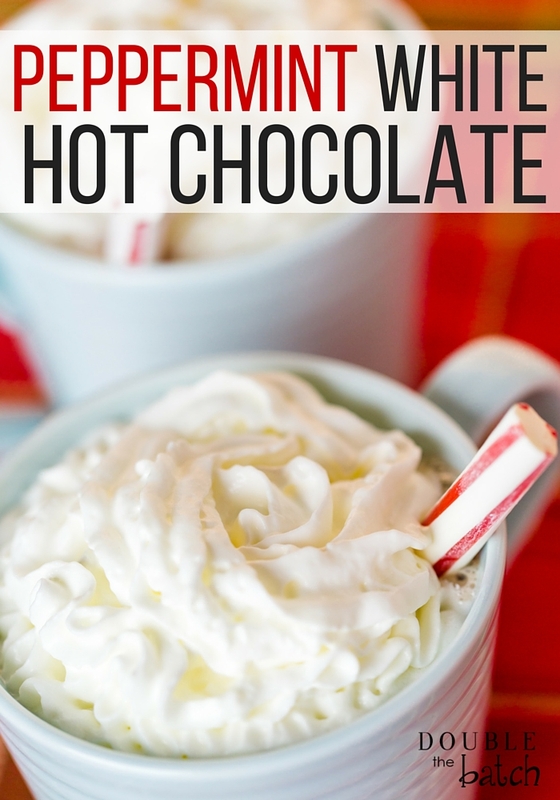 So how about a wonderful Peppermint White Hot Chocolate recipe for you today? This is a perfect one to whip up for the kids for a Halloween party, after a family sledding day, or as something to sip on as you go Christmas caroling through your neighborhood. And since I need “simple” this time of year, I have the perfect—yet oh so simple recipe for you! It only takes about 10 minutes! Enjoy! And Happy Holidays! In a medium saucepan, heat milk and peppermint candies until the candies melt (Medium-low heat, you don't want your milk to boil). Once your candies have melted, stir in your white chocolate chips until they have melted as well. Remove from heat and add your mint and vanilla extracts. Pour your hot cocoa into individual mugs and top with whipped cream and crushed peppermints (not necessary).